The U.S. invasion of Iraq in the spring of 2003 was a decisive moment in the history of the Middle East. True, George W. Bush acquired a demonic image in the eyes of many, both in the region and beyond, but there is no doubt that history will prove that the stand he took against the region's dictators, including some long-standing U.S. allies, was an important factor in creating significant cracks in the Middle East's dictatorial walls and in encouraging the calls for justice and freedom that began to be heard there. In this sense, the Bush administration's Middle East policy, which set as its aim the promotion of democracy, was an important preparatory factor, even an accelerator, for the developments that led to the outbreak of the 2011 Arab uprisings. The Iraq invasion made a strong impression on the region's inhabitants, strengthening Washington's standing in their eyes as a leading world power, politically, economically, and especially, militarily and technologically. At the same time, this image of the United States was accompanied by fear and awe—and unconcealed resentment, jealousy, and even hatred. Nevertheless, the routing of Saddam Hussein's army convinced even Iran's ayatollahs to pause in their mad dash to achieve nuclear power. Only later, after Iraq became a treacherous swamp for Washington because of its failed policies there, did the halo of the initial victory lose its shine. Over time, the historical significance of the Saddam regime collapse lost much of its impact. 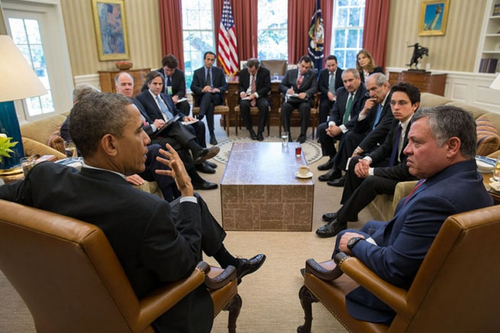 President Obama (left) meets with Jordan's King Abdullah II (right) at the White House, April 26, 2013, where they discussed the Syrian crisis. Obama's initial tough talk about Syrian use of chemical weapons being a "red line" that would evoke a strong U.S. response has become something of a joke even among the war-weary Syrian citizens. In April, the president walked back his pledge demanding instead a "chain of custody" to prove who used which weapons where. At the same time, the war in Iraq placed the Bush administration on a collision course with Assad, who perceived the U.S. attack as being directed not only against Iraq but also against Syria. In the eyes of Damascus, the war was part of a joint U.S.-Israeli campaign directed at breaking up the Arab world and debilitating its might in order to strengthen Israel—or so the Syrians convinced themselves. It also seems that the Assad regime really believed that Washington would find it difficult to overthrow Saddam and assumed that the Vietnam war quagmire would be repeated in Iraq. In their memoirs, both George W. Bush and British prime minister Tony Blair testify that Washington had entertained the idea of carrying the military campaign from Baghdad to Damascus and overthrowing the Assad regime. However, the initial shock experienced in the region, including by Syria, eventually wore off, especially as the U.S. administration found itself entangled in a morass of Shiite-Sunni violence in Iraq. Damascus thus concluded that it was in its interest for the United States to suffer total defeat in Iraq. As a result, the Assad regime began to turn a blind eye and even to assist the Muslim jihadis who crossed Syria on their way to fight the Americans in Iraq. Ironically, these same fighters were destined to return to Syria a decade later when the March 2011 revolution broke out there, leading a jihadist war against Assad's "heretical" regime. In light of this hostile course, the Bush administration came to the conclusion that the Syrian president was a clear and present danger to U.S. interests in the Middle East. However, Washington decided not to adopt a straightforward military option. Instead, U.S. leaders tried to exploit a series of opportunities that emerged in order to push Assad into a corner or even overthrow him. The steps taken were essentially political in character, but there is no evidence that they were part of an orderly or planned-out policy. The first such prospect came in spring 2005 when Bush sought to exploit the murder of former Lebanese prime minister Rafiq Hariri to bring about Bashar's political demise. Alongside the exodus of Syrian troops from Lebanon, Washington acted together with Jacques Chirac's France to bring about the creation of an international investigating commission, and in its wake, an international court, in the hopes of implicating Assad in the Hariri murder. This would then enable a political, or perhaps even a military, campaign to be undertaken against Assad with international backing, not to mention the possibility of bringing him before the International Court of Justice in the Hague. However, in the end it appeared that Hezbollah, rather than Assad, was the main actor behind Hariri's murder. Almost a year later, the Bush administration tried to convince Israel to open a second front against Syria during the 2006 Israel-Hezbollah war; Israel, for its own reasons, did not agree to this. Later, when Israel bombed the nuclear installation Syria was attempting to build with North Korean aid in September 6, 2007, the administration backed the Israeli action. Characteristically, Bush had refrained from acting himself against Syria in this matter. Finally, Washington acted selectively against al-Qaeda training camps and logistic centers in Syria. The various actions undertaken did not interlink in a way to constitute a genuine overall campaign, and they never posed a serious threat to the Syrian regime. Beyond these more energetic actions, the Bush administration settled for a diplomatic campaign, the main aim of which was the political isolation of the Assad regime. However, the partial isolation in which Damascus found itself brought no real results. Damascus was less impressed with the carrot it was being offered—the potential profits it might reap from drawing closer to Washington—and was more focused on the stick, or to be more precise, the absence of any real stick. Washington had simply failed to create any effective means of leverage against Syria. Thus, the era of George W. Bush ended in complete failure insofar as the administration's Syrian policy was concerned: Bush left the White House while Assad remained more solidly entrenched in power than ever. The Obama administration was determined, like any new U.S. administration, to distinguish itself from its predecessor. This effort to embark on a new course meant replacing any perceived sticks with carrots, that is, jettisoning threats, the sporadic use of force, or the more aggressive stance of previous years and employing dialogue, conciliation, and flattery. Indeed, Damascus hastened to welcome the change in policy. However, the Obama administration was soon to learn that, contrary to its expectations, speaking softly without carrying a big stick had no effect whatsoever on the Assad regime. The outbreak of revolution in Syria in March 2011 was met with silence in Washington. Instead of issuing a resolute call to the Syrian ruler to step down, as in the pressure exerted on Egyptian president Hosni Mubarak in February, the administration took several long weeks to articulate its policy toward the Syrian revolution. On March 27, 2011, Secretary of State Hillary Clinton declared that Syria was different from Libya since "there's a different leader in Syria now. Many of the members of Congress of both parties who have gone to Syria in recent months have said they believe [Assad]'s a reformer. What's been happening there the last few weeks is deeply concerning, but there's a difference between calling out aircraft and indiscriminately strafing and bombing your own cities and then police actions, which, frankly, have exceeded the use of force that any of us would want to see." Only in May 2011 did U.S. spokespersons, joined in the end by President Obama himself, begin to declare that the most appropriate solution to the crisis was for Assad to step down. However, the statements issuing from Washington were not accompanied by any concrete actions. Some economic sanctions were imposed, albeit to no avail. Washington also roused itself to extend some limited aid to the opposition forces. For a good many months, it worked—without any real success—to unify the various opposition groups abroad and even those forces operating inside Syria with the aim of creating a military force with an effective and legitimate leadership and command capable of acting against the Syrian army. Simultaneously though, U.S. spokespersons repeatedly emphasized that Washington was not considering any military intervention that would tip the scales decisively. In the beginning of 2013, there were even reports that the State Department and the CIA had recommended supplying weapons to the rebels but that Obama opposed the idea. Having initially called Syrian use of chemical weapons, a "red line" that would incur a strong U.S. response, in April 2013, the president walked back his tough talk, demanding a "chain of custody" to prove who used what and where. Later, in June 2013, the White House eventually confirmed that "our intelligence community assesses that the Assad regime has used chemical weapons, including the nerve agent sarin, on a small scale against the opposition multiple times in the last year … The intelligence community estimates that 100 to 150 people have died from detected chemical weapons attacks in Syria to date; however, casualty data is likely incomplete. While the lethality of these attacks make up only a small portion of the catastrophic loss of life in Syria, which now stands at more than 90,000 deaths, the use of chemical weapons violates international norms and crosses clear red lines that have existed within the international community for decades." However, no action has been taken as a result of this confirmation. The excuse given for Washington's inaction was a lack of an international consensus that would confer legitimacy on any muscular undertaking in Syria. In the U.N. Security Council, Russia, a chief arms supplier to the Damascus regime, repeatedly blocked the adoption of any decision connected with the situation, thereby eliciting toothless denunciations from U.S. spokespersons. However, Russian and Chinese vetoes on Security Council resolutions vis-à-vis the Syrian question also served as a convenient alibi for an administration wary of Middle Eastern entanglements. What might have happened if President Vladimir Putin had removed his opposition to an international operation against Damascus? Despite having publicly concluded that the Assad regime must go, there were a number of distinct reasons for Washington's reluctance to act. To begin with, U.S. leaders were well aware of the weaknesses of the Syrian opposition, especially the divisiveness and fragmentation within the forces in the field. Furthermore, some of these militias consisted of radical elements, such as the Supporters of the al-Nusra Front (Ansar Jabhat al-Nusra li-Ahl al-Sha'm), considered the Syrian branch of al-Qaeda. Thus, any intervention in Syria would likely end up with Washington being drawn into a bloody civil war, similar to the conflicts in Afghanistan and Iraq, from which the Obama administration was only just extracting itself with great effort and fanfare. Had the U.S. administration been more determined in its approach to Syria, it could have taken a number of steps short of a land operation that would have dramatically altered the balance of forces between the regime and its opponents. Washington could have imposed an effective sea and air blockade on Syria or decreed flight-restricted or no-fly zones for the Syrian air force. The administration could also have given more significant aid to the opposition, especially military aid, if not directly, then via their allies in the region. The distance between active intervention and complete inaction is great, and in between, there was much room for maneuver had the will been there. Two U.S. administrations, though quite different in character, found themselves conducting almost identical policies vis-à-vis Syria. Both began by trying to open a dialogue with the Syrian regime, assuming that Damascus had an interest in becoming a U.S. ally. Enticements were offered in areas of special interest to Damascus: recognition of its role in Lebanon and the return of the entire Golan Heights to Syria as part of a peace agreement with Israel. Both administrations undertook actions against Assad only after despairing of any positive results to their conciliatory efforts. Even then, these efforts to act against the Syrian regime came to naught. What can be learned from the Syrian experience of these two very different U.S. administrations? Perhaps the most important lesson is that failure is an assured result in the absence of a vision with well-defined goals and objectives. Undergirding such a policy, Washington needs to have a genuine conviction that it can achieve its goals, alongside a determination to follow through on them. Ironically, it was Assad himself who complained, according to a cable sent by the U.S. embassy in Damascus, that "the American administration has no clear vision about the region." Given a year of sustained U.S.-led international pressure that forced it [Syria] to withdraw its troops under nearly humiliating circumstances, we might have expected the SARG [Syrian government] to be back on its heels and in a defensive, cautious posture. The short-term success of its current confrontational stances have instead boosted regime morale and made it likely that it will continue to seek appropriate opportunities in the coming months to demonstrate its willingness to respond to external pressure with pressure of its own. Wherever possible, it will use its proxies to assert that defiance, in order to avoid being dragged into any unwanted, direct confrontation with the U.S.
What subsequent administrations have failed to understand is that what Arabs resent most is not the U.S. invasion of Iraq or even support for Israel: The Arabs are most angry at the United States because, for them, it is the most recent and convenient "other." To the Arabs, Washington's international state of success and status is, despite whatever current economic problems it faces, a constant reminder of Arab decline from its glorious past. The United States is seen as the successor to Britain and other colonial powers and, therefore, shall be an enemy forever. As long as there is no introspection among Arabs regarding the causes of their decline; as long as the only explanation offered for this decline remains a U.S.-Zionist conspiracy to break and weaken the "Arab world," this rejection of good-faith efforts by the West will remain as it is. What might alter the situation is not necessarily a change in U.S. policy toward Israel but rather a change from within. Curiously, although America remains the quintessential enemy to the Arab world, the dream of the average Arab individual is to immigrate to the States or experience the American way of life. As long as such schizophrenia persists, it is unlikely the patient will be cured. Some changes could improve Washington's standing in the Middle East. Its efforts to send conciliatory messages to the Arabs would be a positive move only if based on a sober and realistic approach. If the world's leading superpower does not believe in its power and looks regularly for excuses not to exercise it, it is bound to be perceived as a paper tiger lacking the ability to advance any particular course in the region. In this regard, it would seem that the negative results of the Obama administration's conduct are more severe than those of its predecessor. For if George W. Bush was not liked, he was at least feared to one degree or another: Barack Obama is neither liked nor feared. Eyal Zisser is dean of the faculty of humanities and the Yona and Dina Ettinger Chair of Contemporary Middle Eastern History at Tel Aviv University. The New York Times, Dec. 3, 2007; The Washington Post, Dec. 4, 2007. David W. Lesch, The New Lion of Damascus, Bashar al-Asad and Modern Syria (New Haven: Yale University Press, 2005), pp. 176-97. George W. Bush, Decision Points (New York: Random House, 2010), pp. 407-15; Tony Blair, A Journey (London: Arrow Books, 2010), pp. 387, 407; Max Abrahms, "When Rogues Defy Reason: Bashar's Syria," Middle East Quarterly, Fall 2003, pp. 45-55; CNN News, May 4, 2003. "A Year After Hariri's Assassination: Asad Strikes a Tougher Pose," U.S. Embassy, Damascus, Wikileaks, Feb. 2, 2006; "Report of the International Independent Investigation Commission established pursuant to Security Council Resolution 1595 [Mehlis report]," United Nations, New York, Oct. 20, 2005; The Guardian (London), June 30, 2011. Israel Hayom (Tel Aviv), Nov. 10, 2010; Ynet News (Tel Aviv), Aug. 13, 2012. Channel 10, Israel, Aug. 26, 2010; Ha'aretz (Tel Aviv), Nov. 10, 2010; Elliot Abrams, Tested by Zion: The Bush Administration and the Israeli-Palestinian Conflict (New York: Cambridge University Press, 2013), pp. 57-9. See, for example, Reuters, Oct. 27, 2008; Syrian Arab News Agency (SANA, Damascus), Oct. 28, 2008. David W. Lesch, Syria, The Fall of the House of Assad (New Haven: Yale University Press, 2012), pp. 20-37. Face the Nation, CBS, Mar. 27, 2013. "Remarks by the President on the Middle East and North Africa," White House Press Secretary, May 19, 2011. Bloomberg News Service (New York), Aug. 21, 2012; The Guardian, Feb. 8, 2013; Ha'aretz, May 4, 2013; Los Angeles Times, May 16, 2013. CBS News, Apr. 30, 2013; The New York Times, June 13, 2013. See, for example, Arutz Sheva (Beit El and Petah Tikva), May 1, 2011; ABC News, Feb. 4, 2012; USA Today, July 19, 2012. Aron Lund, "Holy Warriors: A Field Guide to Syria's Jihadi Groups," Foreign Policy, Oct. 15, 2012; Joseph Holliday, "Syria's Maturing Insurgency," June 2012, "Syria's Armed Opposition," Mar. 2012, "The Struggle for Syria in 2011," Dec. 2011, Syria Project, Institute for the Study of War, Washington, D.C.
 YNet News, Oct. 12, 2012; Daniel Pipes, "Netanyahu Again Offers the Golan Heights to Syria," DanielPipes.org, Oct. 14, 2012. "Asad Warns that Striking Iraq Would Create Chaos," U.S. Embassy, Damascus, Wikileaks, Feb. 2, 2002. "Asad Strikes a Tougher Pose," Feb. 2, 2006. Related Topics: Syria, US policy | Eyal Zisser | Fall 2013 MEQ receive the latest by email: subscribe to the free mef mailing list This text may be reposted or forwarded so long as it is presented as an integral whole with complete and accurate information provided about its author, date, place of publication, and original URL.